Hrosvitha at the Benedictine convent, reading from a book. Of Saxon background, Hrotsvitha became canoness of a convent in Gandersheim, near Göttingen. The convent was self-sufficient, known in its time for being a cultural and educational center. It had been established in the 9th century by Duke Liudolf and his wife and her mother as a "free abbey," not connected to the hierarchy of the church but to the local ruler. In 947, Otto I freed the abbey completely so that it was also not subject to a secular rule. The abbess in Hrotsvitha's time, Gerberga, was a niece of the Holy Roman Emperor, Otto I the Great. There is no evidence that Hrotsvitha was herself a royal relative, though some have guessed that she might have been. Although Hrotsvitha is referred to as a nun, she was a canoness, meaning that she did not follow the vow of poverty, though she still took the vows of obedience and chastity that the nuns did. Richarda (or Rikkarda) was responsible for the novices at Gerberga, and was a teacher of Hrotsvitha, of great intellect according to Hrotsvitha's writing. She later became an abbess. At the convent, and encouraged by the abbess, Hrotsvitha wrote plays on Christian themes. She also wrote poems and prose. In her lives of the saints and in a life in verse of Emperor Otto I, Hrostvitha chronicled history and legend. She wrote in Latin as was usual for the time; most educated Europeans were conversant in Latin and it was the standard language for scholarly writing. Because of allusions in the writing to Ovid, Terence, Virgil, and Horace, we can conclude that the convent included a library with these works. Because of mention of events of the day, we know that she was writing sometime after 968. 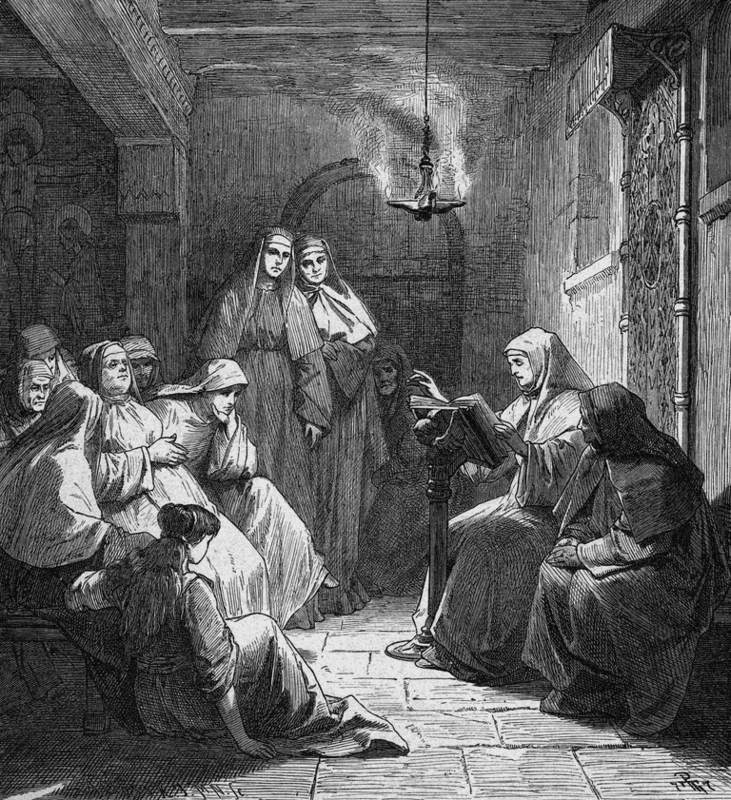 The plays and poems were shared only with others at the abbey, and possibly, with the abbess' connections, at the royal court. Hrotsvitha's plays were not rediscovered until 1500, and parts of her works are missing. They were first published in Latin in 1502, edited by Conrad Celtes, and in English in 1920. From evidence within the work, Hrostvitha is credited with writing six plays, eight poems, a poem honoring Otto I and the history of the abbey community. The plays are unlike morality plays that Europe favored a few centuries later, and there are few other plays extant from her between the Classical era and those. She was obviously familiar with the classical playwright Terence and uses some of his same forms, including satirical and even slapstick comedy, and may have intended to produce more "chaste" entertainment than Terence's works for the cloistered women. Whether the plays were read aloud or actually performed, is unknown. The plays include two long passages which seem out of place, one on mathematics and one on the cosmos. Abraham, also known as The Fall and Repentance of Mary. Callimachus, also known as The Resurrection of Drusiana. Dulcitis, also known as The Martyrdom of the Holy Virgins Irene, Agape and Chionia or The Martyrdom of the Holy Virgins Agape, Chionia, and Hirena. Gallicanus, also known as The Conversion of General Gallicanus. Paphnutius, also known as The Conversion of the Thais, the Harlot, in Plays, or The Conversion of the Harlot Thais. Sapienta, also known as The Martyrdom of the Holy Virgins Faith, Hope, and Charity or The Martyrdom of the Holy Virgins Fides, Spes, and Karitas. The plots of her plays are either about the martyrdom of a Christian woman in pagan Rome or about a pious Christian man rescuing a fallen woman. Her Panagyric Oddonum is a tribute in verse to Otto I, the abbess' relative. She also wrote a work about the abbey's founding, Primordia Coenobii Gandershemensis.